Definitions 1. A factor of integer is an integer that will divide the given integer evenly (with no remainder). Download "Definitions 1. A factor of integer is an integer that will divide the given integer evenly (with no remainder)." 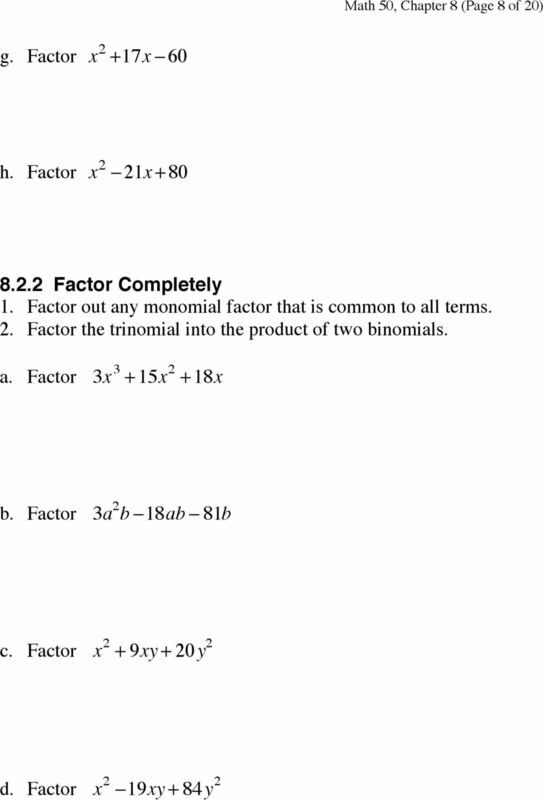 6 Math 50, Chapter 8 (Page 6 of 20) 8.2 Factor Trinomials of the form x 2 + bx + c x 2 + bx + c b c Factored form x 2 + 9x +14 (x + 2)(x + 7) x 2 - x -12 (x - 4)(x + 3) x 2-2x -15 (x - 5)(x + 3) Note The leading coefficient (the coefficient on the x 2 term) is one. 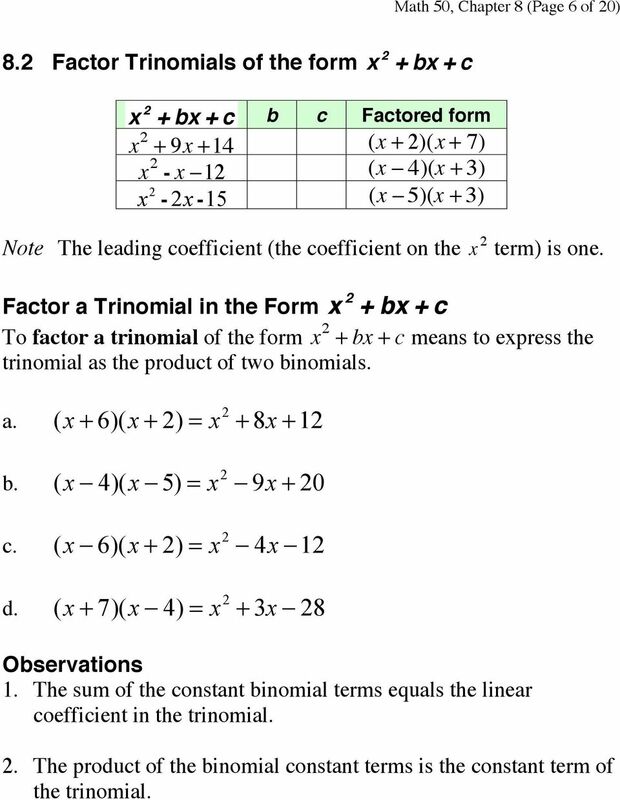 Factor a Trinomial in the Form x 2 + bx + c To factor a trinomial of the form x 2 + bx + c means to express the trinomial as the product of two binomials. a. (x + 6)(x + 2) = x2 + 8x +12 b. (x - 4)(x - 5) = x2-9x + 20 c. (x - 6)(x + 2) = x2-4x -12 d. (x + 7)(x - 4) = x2 + 3x - 28 Observations 1. The sum of the constant binomial terms equals the linear coefficient in the trinomial. 2. 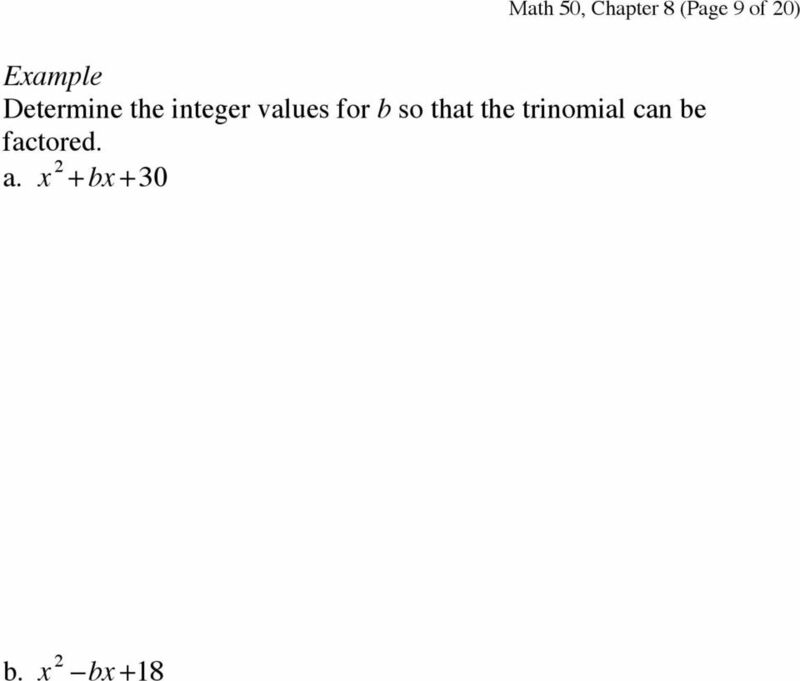 The product of the binomial constant terms is the constant term of the trinomial. 18 Math 50, Chapter 8 (Page 18 of 20) 8.5 Solving Equations Definitions A second degree polynomial equation of the form ax 2 + bx + c = 0 is called a quadratic equation in standard form. Furthermore, the ax 2 term is called the quadratic term. The linear term is bx. 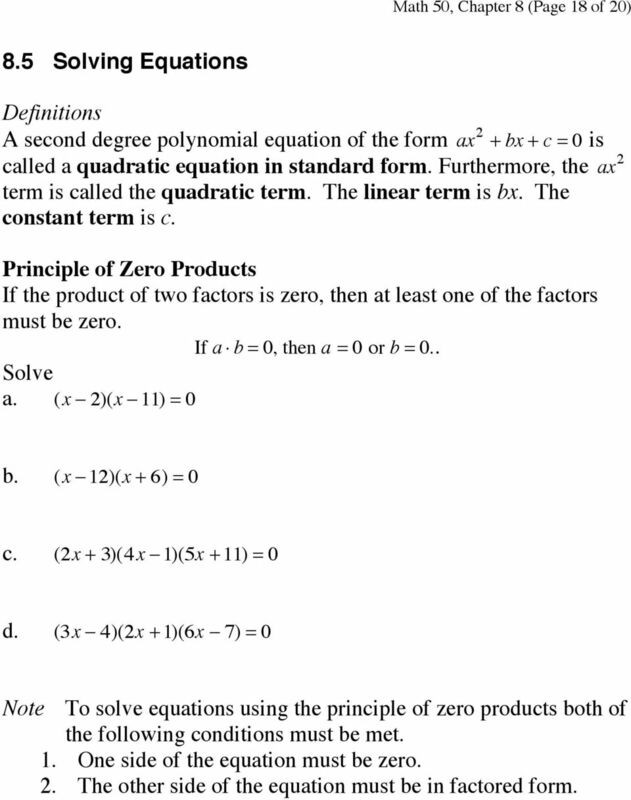 The constant term is c. Principle of Zero Products If the product of two factors is zero, then at least one of the factors must be zero. If a b = 0, then a = 0 or b = 0.. Solve a. (x - 2)(x - 11) = 0 b. (x - 12)(x + 6) = 0 c. (2x + 3)(4 x - 1)(5x + 11) = 0 d. (3x - 4)(2x + 1)(6x - 7) = 0 Note To solve equations using the principle of zero products both of the following conditions must be met. 1. One side of the equation must be zero. 2. The other side of the equation must be in factored form. 20 Math 50, Chapter 8 (Page 20 of 20) Application Problems Example 1 The sum of the squares of two consecutive positive odd integers is equal to 130. Find the two integers. 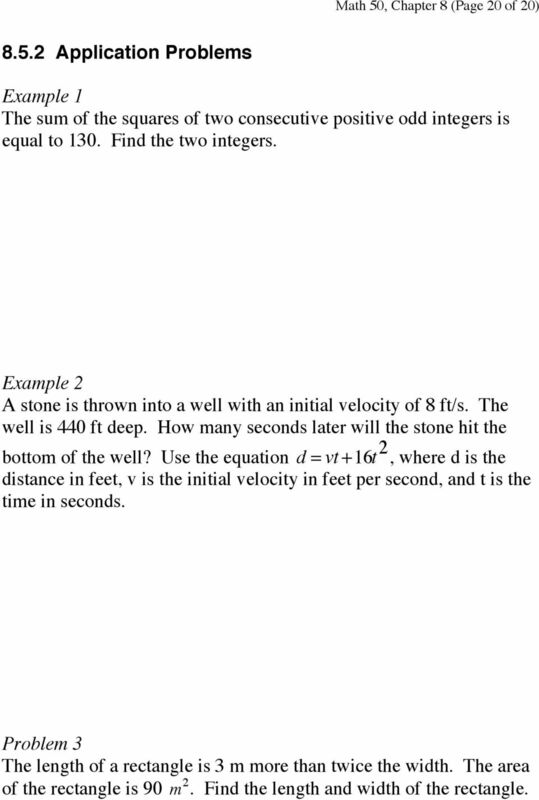 Example 2 A stone is thrown into a well with an initial velocity of 8 ft/s. The well is 440 ft deep. How many seconds later will the stone hit the bottom of the well? Use the equation d = vt +16t 2, where d is the distance in feet, v is the initial velocity in feet per second, and t is the time in seconds. Problem 3 The length of a rectangle is 3 m more than twice the width. The area of the rectangle is 90 m 2. Find the length and width of the rectangle. MATH 90 CHAPTER 6 Name:. expression is written horizontally. The Last terms ((2)( 4)) because they are the last terms of the two polynomials. This is called the FOIL method. 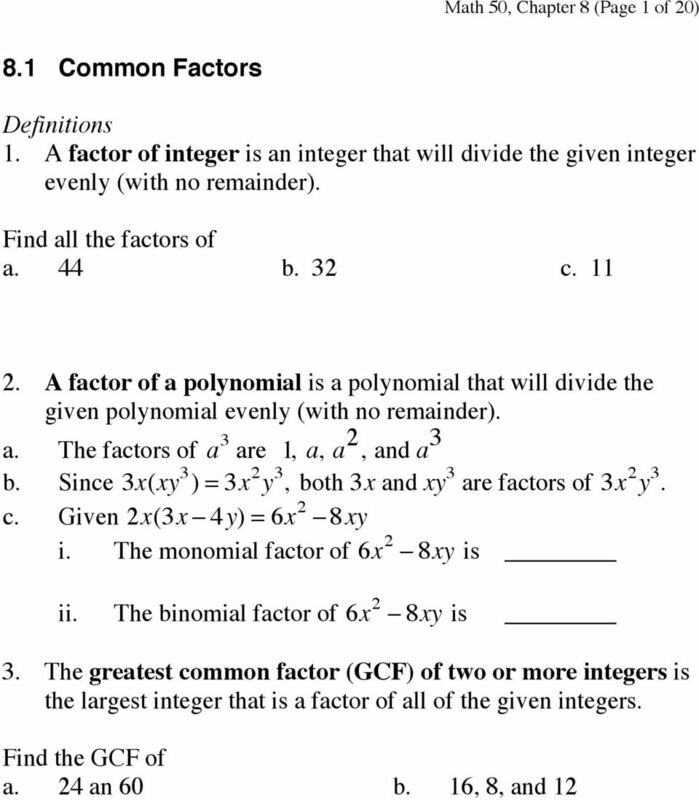 1.3 Polynomials and Factoring Polynomials Constant: a number, such as 5 or 27 Variable: a letter or symbol that represents a value. Term: a constant, variable, or the product or a constant and variable. x n = 1 x n In other words, taking a negative expoenent is the same is taking the reciprocal of the positive expoenent. 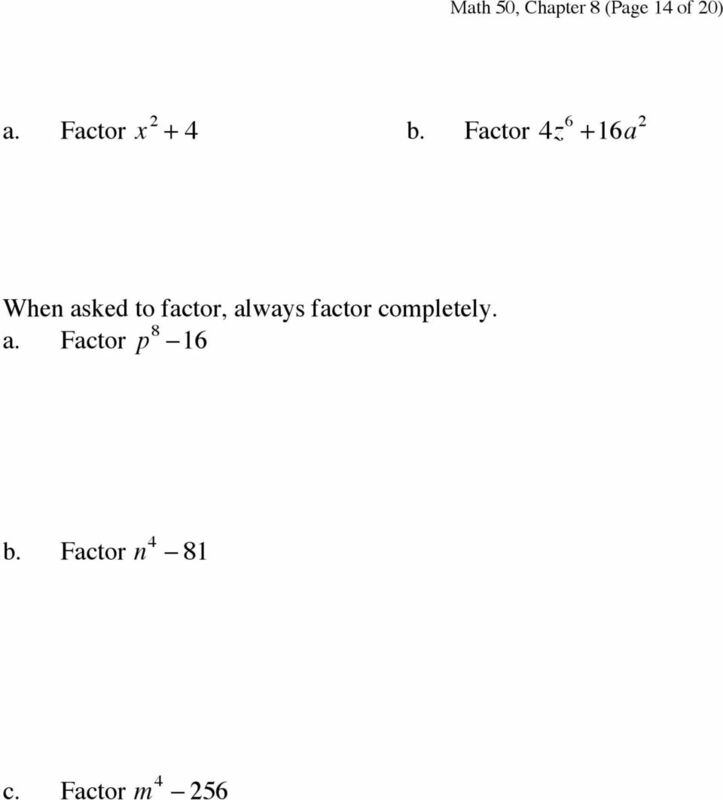 5.7 Factoring ax 2 bx c (5-49) 305 5.7 FACTORING ax 2 bx c In this section In Section 5.5 you learned to factor certain special polynomials. 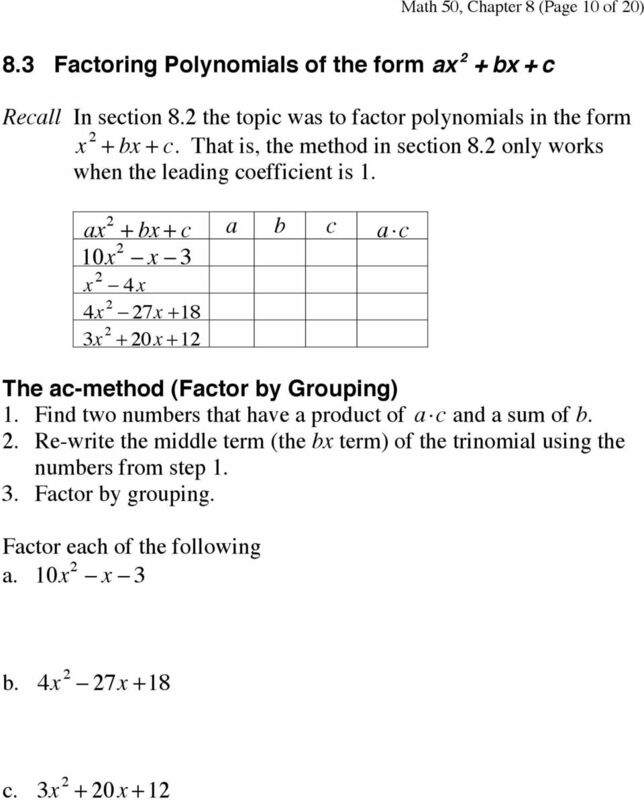 In this section you will learn to factor general quadratic polynomials. 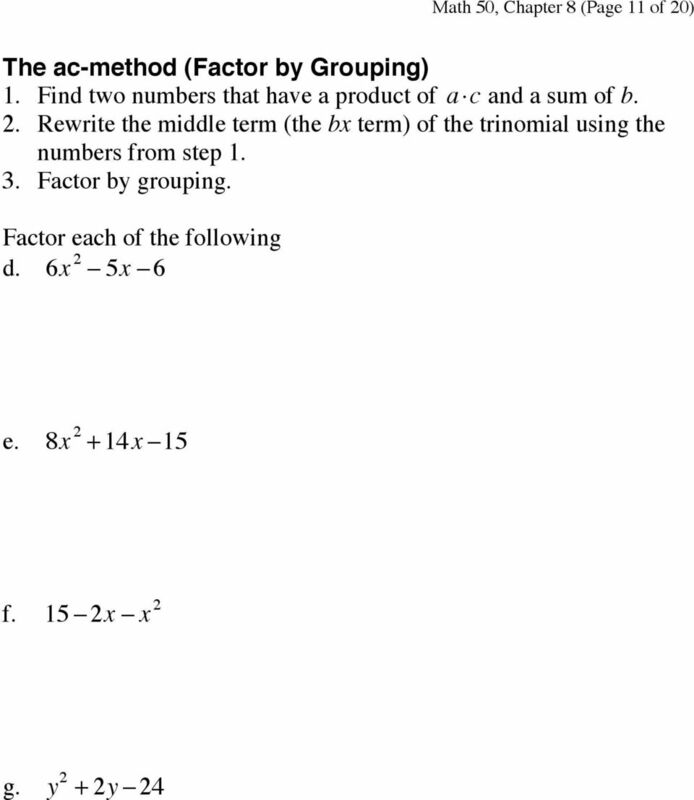 ( ) FACTORING. x In this polynomial the only variable in common to all is x. In the above, the number 19 is an example of a number because its only positive factors are one and itself. Mathematics Placement The ACT COMPASS math test is a self-adaptive test, which potentially tests students within four different levels of math including pre-algebra, algebra, college algebra, and trigonometry. 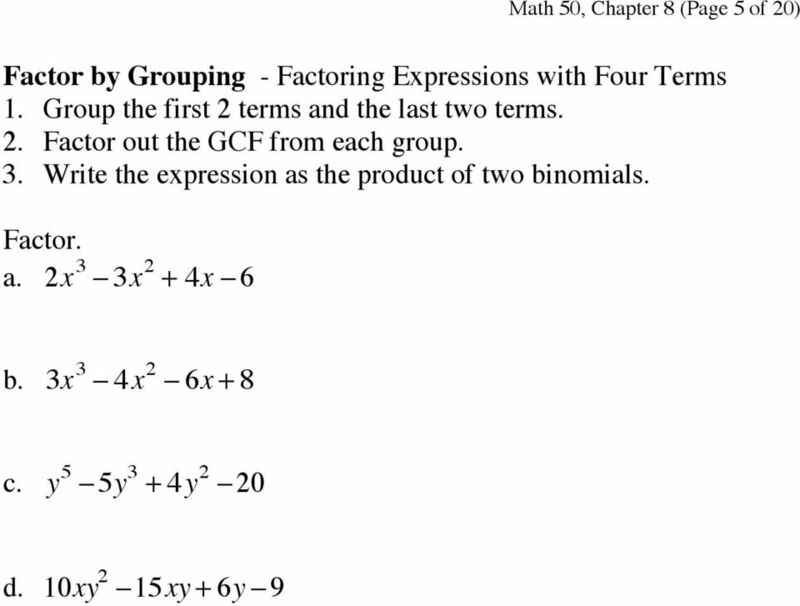 Name: Factoring Algebra- Chapter 8B Assignment Sheet Date Section Learning Targets Assignment Tues 2/17 Find the prime factorization of an integer Find the greatest common factor (GCF) for a set of monomials. 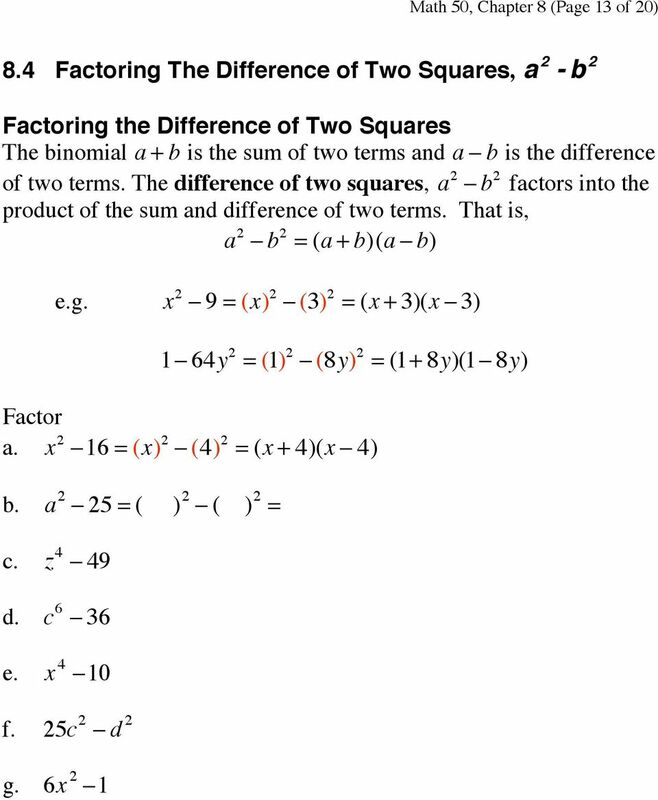 This is Factoring and Solving by Factoring, chapter 6 from the book Beginning Algebra (index.html) (v. 1.0). 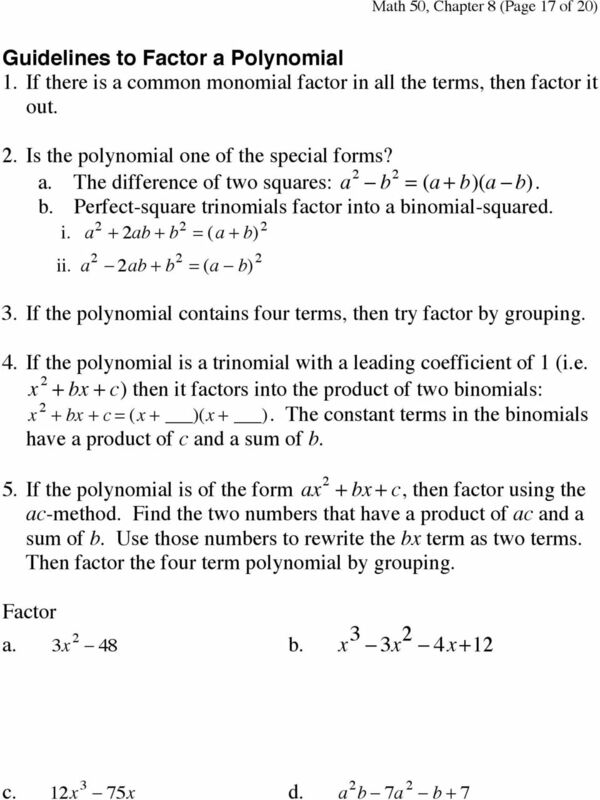 By reversing the rules for multiplication of binomials from Section 4.6, we get rules for factoring polynomials in certain forms. 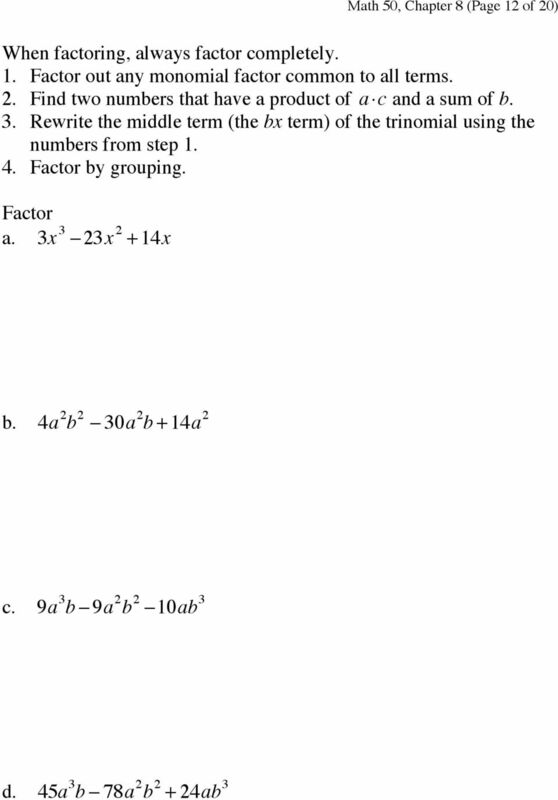 386 CHAPTER 6 Factoring and Applications 6.1 The Greatest Common Factor; Factoring by Grouping OBJECTIVES 1 Find the greatest common factor of a list of terms. 2 Factor out the greatest common factor. 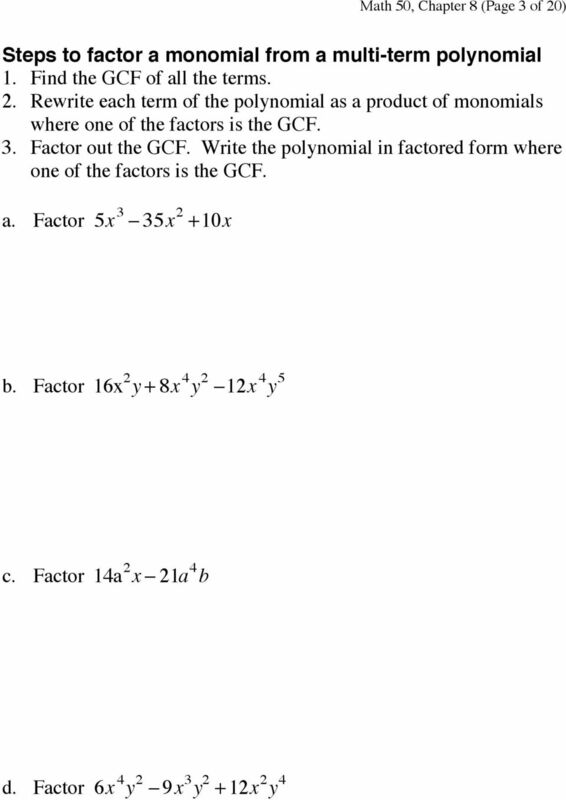 When factoring, we look for greatest common factor of each term and reverse the distributive property and take out the GCF. Tallahassee Community College 55 FACTORING TRINOMIALS IN THE FORM OF ax 2 + bx + c This kind of trinomial differs from the previous kind we have factored because the coefficient of x is no longer "1". C H A P T E R 5 Factoring he sport of skydiving was born in the 1930s soon after the military began using parachutes as a means of deploying troops. T Today, skydiving is a popular sport around the world. 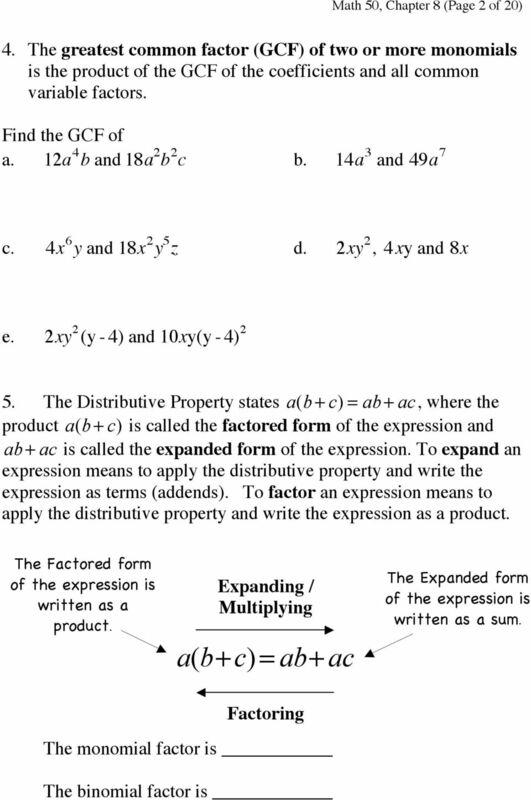 Factoring. 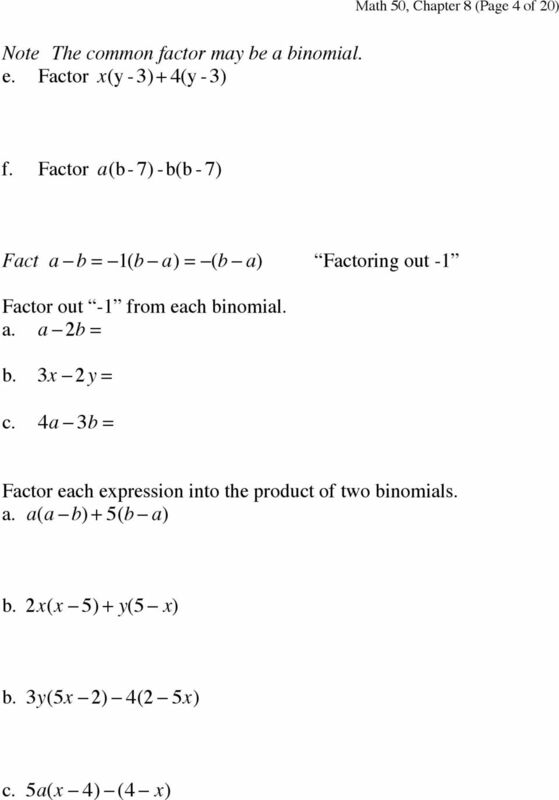 Factoring Monomials Monomials can often be factored in more than one way. A. Factoring out the Greatest Common Factor. DETAILED SOLUTIONS AND CONCEPTS - FACTORING POLYNOMIAL EXPRESSIONS Prepared by Ingrid Stewart, Ph.D., College of Southern Nevada Please Send Questions and Comments to ingrid.stewart@csn.edu. Thank you! MATH 0034 Fundamental Mathematics IV http://www.math.kent.edu/ebooks/0034/funmath4.pdf Department of Mathematical Sciences Kent State University January 2, 2009 ii Contents To the Instructor v Polynomials. 10 7, 8. 2. 6x + 30x + 36 SOLUTION: 8-9 Perfect Squares. The first term is not a perfect square. 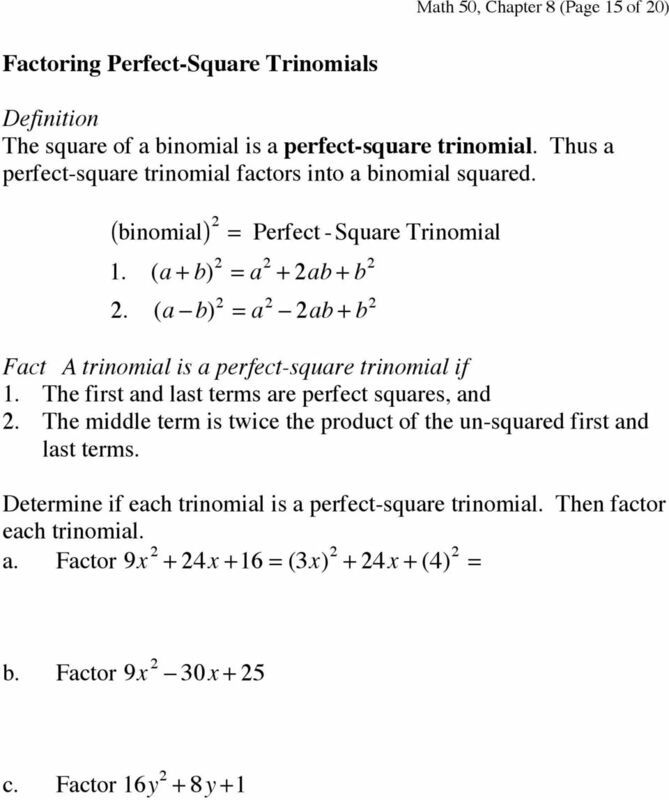 So, 6x + 30x + 36 is not a perfect square trinomial. QUADRATIC EQUATIONS Definition ax 2 + bx + c = 0 a, b, c are constants (generally integers) Roots Synonyms: Solutions or Zeros Can have 0, 1, or 2 real roots Consider the graph of quadratic equations. 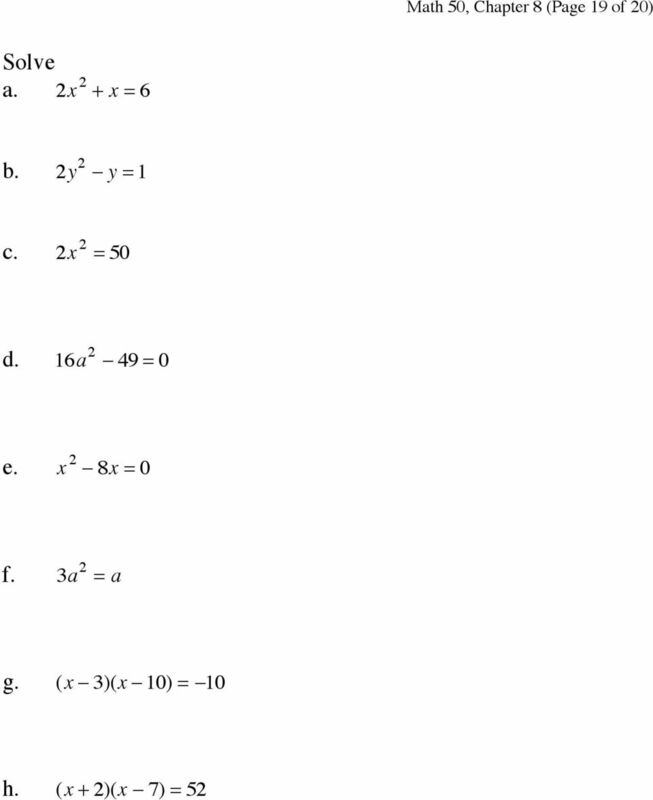 In this section, you will develop a method to change a quadratic equation written as a sum into its product form (also called its factored form). Lagrange Interpolation is a method of fitting an equation to a set of points that functions well when there are few points given.